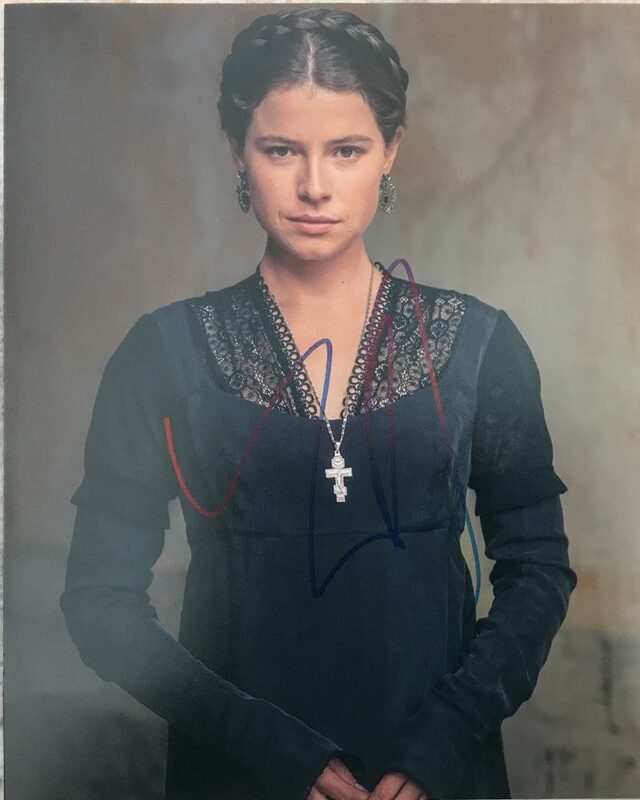 Jessie Buckley is an Irish singer and actress, who came in second place in the BBC talent show-themed television series I’d Do Anything, and subsequently played Anne Egermann in the West End revival of Stephen Sondheim’s A Little Night Music. Most recently, Buckley appeared on three BBC television series, as Marya Bolkonskaya in BBC’s adaptation of Leo Tolstoy’s War and Peace, as Lorna Bow in Taboo and as Honor Martin in The Last Post. Buckley was born in Killarney, County Kerry, the eldest of five children. Her mother, Marina Cassidy, encouraged her to sing and coached her. She has a brother and three sisters. Buckley went to Ursuline Secondary School, an all-girls convent school in Thurles, County Tipperary, where her mother works as a vocal coach and where she performed in school productions. She played a number of male roles at school, including the male lead role of Jets gang founder Tony in the musical West Side Story and Freddie Trumper in Chess. She has achieved Grade eight in piano, clarinet and harp with the Royal Irish Academy of Music. She is also a member of the Tipperary Millennium Orchestra. Buckley also attended The Association of Irish Musical Societies (AIMS) workshops during the summer, to help improve her singing and acting; it was where she was then recognised as a talented actress and was encouraged to apply for Drama School in London. Just before she auditioned for I’d Do Anything, she was turned down by two drama schools, including one the day before her first audition for the show. In 2008, Buckley won the AIMS Best Actress award for her portrayal of Julie Jordan in the Killarney Musical Society production of Carousel. Buckley competed in I’d Do Anything, a search for a new, unknown lead to play Nancy in a London West End stage revival of the British musical Oliver. Buckley reached the final on 31 May 2008, finishing in second place behind Jodie Prenger. Before the final vote was announced in Show two of the final, Graham Norton asked the panel who they each thought was Nancy. Three of the panel said Buckley and two Prenger. John Barrowman and Denise van Outen said “Jodie”, while Barry Humphries, Cameron Mackintosh and Andrew Lloyd Webber said “Jessie”. However, the public voted for Jodie. uckley performed at the Andrew Lloyd Webber’s Birthday in the Park show in Hyde Park, London on 14 September 2008, singing “I Don’t Know How To Love Him” as a solo and “Light at the End of the Tunnel” from Starlight Express with fellow I’d Do Anything finalists Keisha Amponsa-Banson, Niamh Perry, Rachel Tucker as well as Any Dream Will Do finalists Daniel Boys, Lewis Bradley, Ben James-Ellis and Keith Jack. On 18 September she and Aoife Mulholland performed with the RTÉ Concert Orchestra at an Andrew Lloyd Webber evening at the National Concert Hall in Dublin. On 26 August 2008 Buckley performed on Denny Street in Tralee, Co. Kerry where the first ever Millionaire raffle was broadcast live on RTÉ Radio 1. After this, Jessie performed at a charity concert in Tipperary, where she announced that she would be starting rehearals for A Little Night Music in London the following Monday. Buckley was offered the opportunity to understudy Nancy, but turned it down in favour of another production: on 10 October 2008 it was announced that Buckley would be appearing in a revival of the Stephen Sondheim musical A Little Night Music, in the role of Anne Egerman, at the Menier Chocolate Factory, a fringe Studio Theatre, in London from 22 November 2008 to 8 March 2009. She appeared alongside Maureen Lipman and Hannah Waddingham in the production, which was directed by Trevor Nunn. A Little Night Music transferred from the Menier Chocolate Factory to the Garrick Theatre in London’s West End on 7 April 2009 (previews from 28 March – 6 April). A Little Night Music was Buckley’s West End debut. The show closed on 25 July 2009. Since then, she has appeared in a number of concerts nationally, including a Christmas concert alongside Maria Friedman, Cantabile – the London Quartet and Tim Rice, and in February 2010 appeared alongside Daniel Boys (and Night Music co-star Kelly Price) in a series of Valentine musical concerts.